That said, I love these pieces - Buddhas numbering two through six of 108. Remember what they looked like before they went naked into the kiln? What I love is not what I made of them, but what the fire and ash made of them... those amazing smoky amber surfaces, wrought by elemental forces. The pots in the Anagama kiln get white hot. Naked flames lick around them, smoke and ash and mysterious chemical vapours whirl in and out of them, leaving traces on their surface. It's alchemy. I prayed over these pieces when they went in to the kiln. On the second night of the firing, while my partner was working late stoking that fire, I dreamt I was in the heart of the kiln, with these cups - undergoing violent but beautiful transformation. I was worried about them like they were little parts of me, hanging on in a dramatic and dangerous place. I saw some magical things come out of that kiln when we unloaded it, like a bowl that had gone in full of seaweed, and came out with seagreen glass pooled in the bottom. It's an object lesson - in life, in practice, in love. Surrender and be transformed. Go in naked and raw, come out strong and shiny, indelibly marked by a mystery, glowing. Bronwyn- This is a wonderful heartfelt project. The cups are beautiful. I look forward to finding out how to adopt one! 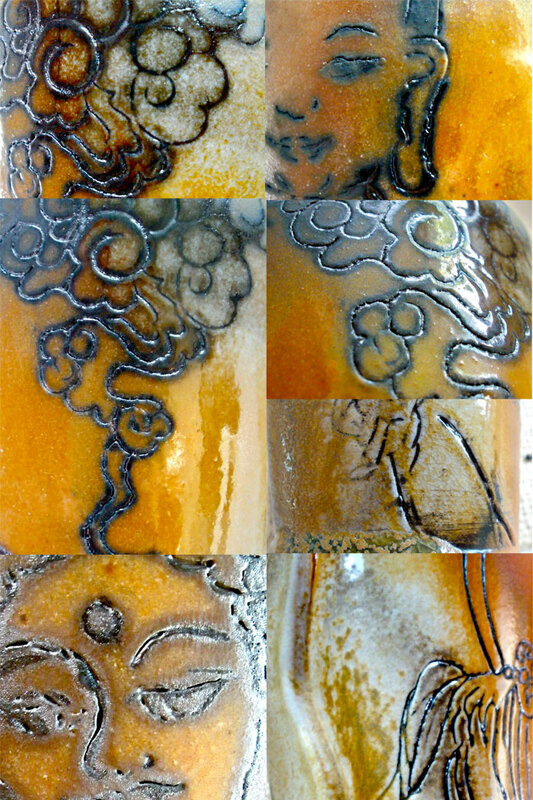 As an exploration of creativity, community, and devotion, ceramic artist & painter Bronwyn Simons is creating 108 images of the Buddha between May 6, 2012, and May 6, 2013. Over half of these images, small ceramic sculptures, will be released into the wild, and their journey recorded on this blog. ©2012 Bronwyn Simons. Powered by Blogger.